Last month ago I wrote a column for Wired.com, Rebooting web comments, that attracted some unsavory feedback. Had the flamers read beyond the second paragraph they might have seen that I wasn’t insisting everyone must use verifiable identities online. But they didn’t. So I wrote another column last week, Own your words, to clarify my position. My first blogging tool, back in 2001, was Dave Winer’s Radio UserLand. One of Dave’s mantras was: “Own your words.” As the blogosphere became a conversational medium, I saw what that could mean. Radio UserLand didn’t support comments. That turned out to be a good constraint to embrace. When conversation emerged, as it always will in any system of communication, it was a cross-blog affair. I’d quote something from your blog on mine, and discuss it. 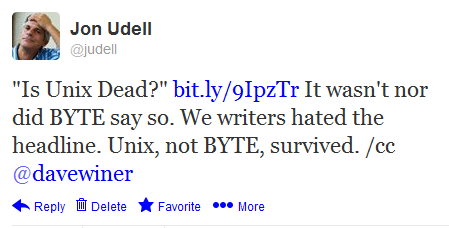 You’d notice, and perhaps write something on your blog referring back to mine. This cross-blog conversational mode had an interesting property: You owned your words. Everything you wrote went into your own online space, was bound to your identity, became part of your permanent record. As a result, discourse tended to be more civil than what often transpired in Usenet newsgroups or web forums. In those kinds of online spaces, your sense of identity is attenuated. You may or may not be pseudonymous, but either way the things you say don’t stick to you in the same way they do if you say them in your own permanent online space. Later blogs evolved forum-style comments which concentrated discussion but recreated the old problems: attenuation of identity, loss of ownership of data. Then came Twitter and Facebook and, so the story goes, “social killed the blogosphere.” It was easier to read and write in those online spaces, blogging declined, and Google’s recent decision to retire its RSS reader is being widely regarded as the nail in the blogosphere’s coffin. Of course that’s wrong. One of the staples of tech punditry is the periodic declaration that something — Unix, the Web, Microsoft, Apple, the blogosphere — is dead. Will Google Reader’s exit spell the end of the blogosphere or its rebirth? Nobody knows, and since I’m no longer in the pageview business I won’t even hazard a prediction. Instead I want to highlight something that’s bigger than blogs, bigger even than social media. Owning your words is a fundamental principle. It seemed new at the dawn of the blogosphere but its roots ran deeper. They were woven into the fabric of the Internet which, at its core, is a network of peers. Your Twitter and Facebook avatars are not first-class peers on the network in these ways. Which isn’t to say they aren’t useful. Second-class peers are incredibly useful, largely because they enable us to avoid the complexities that make it challenging to operate first-class peers. Those challenges are real. But they’re not insurmountable unless we believe that they are. I don’t believe that. I hope you won’t. What some of us learned at the turn of the millenium — about how to use first-class peers called blogs, and how to converse with other first-class peers — gave us a set of understandings that remain critical to the effective and democratic colonization of the virtual realm. It’s unfinished business, and it may never be finished, but don’t let the tech pundits or anyone else convince you it doesn’t matter. It does. Author Jon UdellPosted on 18 Mar 2013 Categories . Hear, hear! As is often the case popularity, fashion, etc. do not rule the day. AOL was at one time what some of it’s membership believed to be “online” when they would say the words, “Yes, I am online”. But it took the cable modem and DSL providers to show everyone what ELSE was meant by online. Now we’re blinkered and blinded and narrowed down into these “funnels” and “concentrations” of activity and community. If blogging and RSS are dead, then the whole Internet and what it represents is dead. And it hasn’t happened,… (yet?). As long as it’s still legal for an individual to buy/sell a domain name and register it with a Name Authority worldwide we still have some autonomy. Once that’s taken away then I fear the worst has happened.